This is the original White’s Smoke Jumper that set the standard in the forest industry. 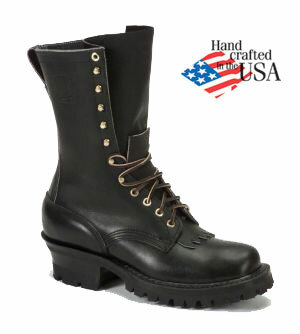 It’s been imitated by virtually every boot manufacturer in the world. But when it comes to the quality of materials and care in craftsmanship, there is absolutely no comparison. Its unsurpassed heritage has spread from wildland fire fighters to hunters, construction workers to truckers, and others who live in their boots and expect the very best. Hand-sewn, stitch-down construction provides the flexibility and comfort that cannot be achieved any other way. If you want the original boot that aced the test of time, this one’s for you. During it’s over 100-year history, White’s has maintained an unwavering focus on quality in the boots that it builds and the products that it provides. Today they still build their boots one at a time by hand for one simple reason, to ensure that their customers enjoy the finest boots made anywhere in the world. They know that’s a strong claim, but it’s one they gladly back every day by continuing to use only the finest materials, designs, and craftsmanship.